In the past, performance measurement in most companies has focused primarily on indicators of operational performance, generally in the form of quantitative financial measures. Most measures gauge the past and tell little about the future. Often they do not point to important indicators of strategic improvement or how the company may be creating or hurting future value. The Balanced Scorecard approach to strategic evaluation was developed by Kaplan and Norton in the early 1990s to address these issues. With the Balanced Scorecard approach, Kaplan and Norton recommend development of indicators which provide managers with feedback from a financial perspective, internal business perspective, innovation and learning perspective and customer perspective. The Balanced Scorecard is designed to help evaluate the company’s strategy at all levels. Without a balanced set of indicators, performance improvements in one area may be at the expense of performance in other areas or short term improvements may degrade long term value. The Scorecard forms a framework for achieving agreement about strategy within the organization, communicating that strategy to employees and assessing its validity and usefulness. The key to implementing the balanced scorecard, as with any other evaluation method, is to recognize that it is important to measure those things which are of strategic importance to the company. 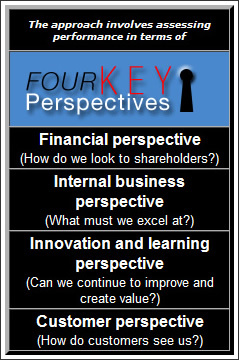 Meaningful indicators can only be arrived at by working from a strategic framework. The following is an example from Kaplan, R.S. Linking the Balanced Scorecard to Strategy, California Management Review, Vol 39, No 1 1996, which demonstrates differences between "leading" and "lagging" indicators. Leading indicators are those that are more immediately measurable, lagging indicators are those that are a result of implementing and continuously monitoring the activities which impact leading indicators. A good scorecard will emerge over time, this is a dynamic tool and should be regularly revisited and adjusted to accommodate increasing understanding of the influence of factors effecting strategy. Wolf Management Consultants have extensive experience assisting companies develop balanced scorecards at the strategic, business and operational levels. We focus on building a process that enables your company to measure key indicators of performance and enables you to manage that process over time. The balanced scorecard process is much more than a set of measures; it is a method of management that engages all employees and aids strategy implementation at all levels.